Sometimes I feel in this world of social media, where we are consuming information by the second, my Italian wishlist changes every day! I don’t know if that’s a good thing or a bad thing but there are far too many small towns, too many places, too many things to experience in the Bel Paese. Small charming towns are actually my thing, I am known to hunt for favorites and visit them during my annual retreats in Italy. Sometimes I read a lot places before visiting while on other times, I like to be surprised! This past winter, I traveled to some gorgeous Italian towns that are really really worth the stop. Many more of these gorgeous charming small towns can be found here too. Right up in the northern region of Liguria, Savona is a town that is becoming popular with cruise ships that travel in the Mediterranean. You might get put off with it’s ugly modern side like I did, but move towards the centre and get ready to be charmed with it’s alleys as any other Italian city! Savona has a rich history with a 12th century tower, an art museum, a fortress or Priamar with amazing exhibits and a long line of restaurants and bars at the port side. It is a town trapped in the medieval time and definitely calls for a visit. 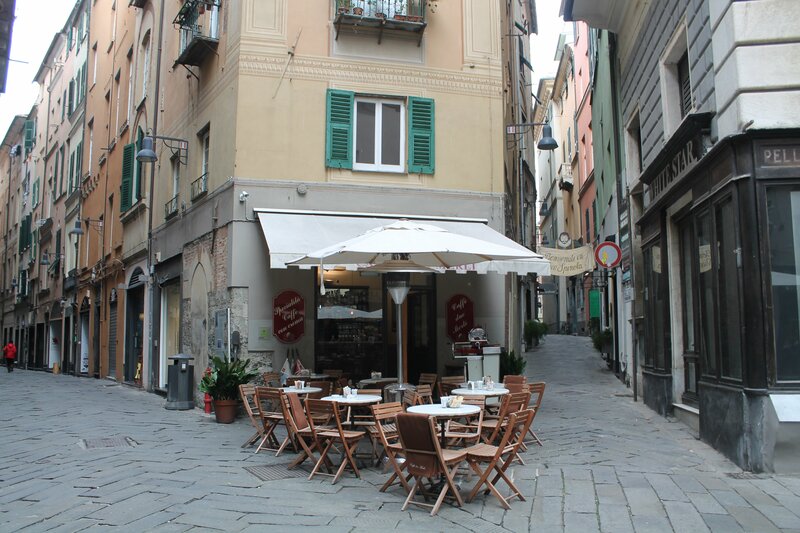 Savona is a charming Italian town that is quite underrated in the region of Liguria as Cinque Terre and Genova take the cake. But do visit this port town and don’t forget to sample a delicious farinata bianca from my side! How to Reach: There are direct trains to reach Savona from Genova. If you are visiting from Turin, there could be a change of trains at Genova. Another town in Liguria that caught my attention was Noli. With its pastel back streets and medieval lanes, Noli is a great catch. It faces the sea and is only 50 minutes from Genoa!! So if you want to spend a lazy day in Liguria, Noli should be on your list. The town still has a perfectly preserved castle on top of a hill and a Roman styled church. No time is less is in this very non touristy part of Liguria. (no foreign tourist except me!) Do visit Ines restaurant and try their delicious gnocchi and pasta alla vongole. How to Reach: There are no direct trains to reach Noli from Genova. The nearest train station is Finale Ligure Marina. If you are visiting from Turin, there might be a change of trains at Savona. I wanted to stop in a town on the outskirts of Turin that might as well be called Turin itself, but it wasn’t. Moncalieri has a whole other vibe. Expensive boutiques, fashionable people and chic streets, Moncalieri is dreamy! It’s level upped a tad more in the foggy winter when I visited. The town’s historic centre is filled with cars but don’t miss the old styled meat shops and charming Bars. The small Italian town is gorgeously charming and also boasts a 12th century castle that was once the home of the King Victor Emmanuel II. How to Reach: There are direct trains to reach Moncalieri from Turin. Urbania is situated in the region of Le Marche and is home to many things. It is known for ceramics, it’s historically imposing Palazzo Ducale (Ducal Palace) and most of all it’s celebration of the festival La Befana that is telecast throughout Italy on the day of it’s celebration- January 6! The town is so so beautiful and has many streets to wander in. Palazzo Ducale is exceptional and might I add, very very cold in the winter!! Adjacent to Palazzo Ducale is a historic Library and Civic Museum. Few people stay in Urbania so you might see a lot of “Vendesi” signs which means that the house is up for sale. Would you want to buy?? How to Reach: There are no trains to Urbania and the nearest train station is Pesaro. You might have heard of the International White Truffle Fair in Alba but have you heard of there being another one in Sant’Angelo in Vado, Le Marche?? This charming small little town in Italy holds the International fair in October which is as old as the one in Alba. The town proudly boasts of the earthly flavors of it’s truffles in it’s historic centre. Already on a pretty riverfront, Sant’Angelo in Vado just made it to my wishlist for a second visit- this time obviously during the Truffle Fair! How to Reach: There are no trains to Sant’Angelo in Vado and the nearest train station is Pesaro. If you made it to the end of this long post, THANK YOU SO MUCH for reading!! Have you read any of these books based on small towns in Italy?? Thanks for this. It is always good to discover hidden gems in the bel paese to file away for reference for future visits! The 7 months I spent living in Italy in my late teens had a profound influence on the way I perceived and chose to live life…I’m finally starting to write a book about it now. Isn’t it the best? I love the big cities too but there is something very special about these gems. How wonderful for you!! Looking forward to knowing more soon then?? Yes I agree, plus there are fewer tourists (even though that sounds hypocritical, being a tourist myself! Thanks for the lovely post, as if I needed more reasons to fall for Italy. Haha I love this GIF. I know what you mean. Any far fetched plans that could come true ;)?? these towns are all so beautiful – especially the ceramics of Urbania. small towns have such a charm and it’s always so interesting to think about the experiences/sights/culture you’d be missing if you only stuck to the big cities! Urbania was such a find!! And the river adds to it’s beauty. I agree totally. What lovely experiences and charming little towns. I would love to visit Urbania (I’d never heard of it) if it’s the home of La Befana parades. Some of the most fun I’ve had in Rome was watching their parade. Small is beautiful. All of these look so charming! the small less touristy areas are always the cutest!!! True 🙂 Have a great evening! What a wonderfully unusual list! I must visit these places. I’ve heard of Savona but not of the rest of them (over here is a town called Sovana). Those towers of Savona are great! As is the dog statue. 😀 And many other lovely glimpses. As you know, I have a list of places in Italy to visit too and it’s getting longer instead of shorter. To new discoveries! Thank you so much for your post…my mom was from Milan and I love Italy. So great to see you feature some of the small towns! Thanks for reading Valerie 🙂 Are you based in Italy?? We have spent so much of our time this trip in the big cities at the start of high season — I’m ready for more small-town travel on my next visit to Italy! thank you! Castel Gandolfo is already scheduled! I’ll check out your Rome tab. Grazie, cara, e buona giornata. I’m excited to see what you end up doing 🤗🤗 anche a te! These little towns look gorgeous – so picturesque. I can’t believe I have never heard of any of them. Thanks for sharing these hidden gems. I had never heard of any of these! I love how Italy has so much more to offer than the big cities – they all look lovely and worth the trip! Thanks for your comment Kathi .. I’m glad I gave you a bigger list 😉 absolutely! !